GMC's all-new baby crossover has been spotted undergoing road tests in Malibu, Calif.
A new entry-level crossover from GMC is getting closer to production. 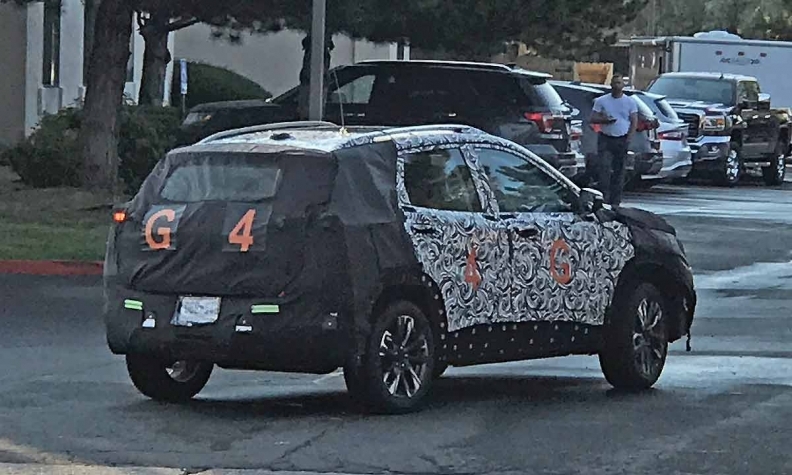 Spy photographers caught a heavily camouflaged version of the vehicle -- it is smaller than the compact GMC Terrain -- testing for the first time in Arizona. The baby GMC is expected to be based on GM's Gamma-2 architecture that underpins the Buick Encore, Chevrolet Spark and Chevrolet Trax in the U.S. The expected subcompact crossover could be called Granite, after a 2010 concept. It is expected to arrive in showrooms in 2020. It's hard to tell many design aspects of the vehicle. However, it doesn't take too much imagination to see the brand's new slotted grille on the front of the vehicle. GMC has been planning a smaller crossover/SUV for some time. However, unlike early expectations of such a vehicle being a body-on-frame Jeep Wrangler-fighter, the production crossover is expected to compete against the Jeep Renegade and Honda HR-V.
Duncan Aldred, head of Buick and GMC worldwide, has said a vehicle smaller and less expensive than the Terrain is "a logical place" for the brand to expand. "To me, there is more room for SUVs in the GMC stable," Aldred told Automotive News in August 2017. "An obvious place for GMC to be if it expands is that small SUV segment." A compact or subcompact offering would help broaden GMC's range and bring in younger buyers, much like the Encore subcompact has done for Buick.